What is dark matter? No one really knows, but one possibility is that it is made up of miniature black holes from the Big Bang. Dark matter, the mysterious extra mass in the universe that emits no light yet exerts a gravitational pull, may actually be made up of primordial black holes that originated with the Big Bang. And these mini black holes can thank the Higgs boson for their birth — at least according to a new theory. This theory, described March 23 in the journal Physical Review Letters, posits that these primeval black holes were created from instabilities in the field that gives rise to the Higgs boson, the mysterious "God" particle discovered at the Large Hadron Collider (LHC). 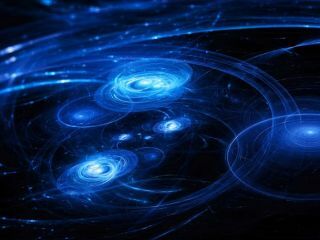 "In principle, the explanation may count for all the dark matter," in the form of primordial black holes, said study co-author Antonio Riotto, a physicist at the University of Geneva, in Switzerland. However, not everyone is convinced, with some physicists saying that these primordial black holes are unlikely to explain all the dark matter found in the universe. What's more, the Higgs' mass implied that during the inflation of the early universe, when matter raced outward immediately after the Big Bang, the unstable Higgs field experienced quantum fluctuations, where there were different densities of matter in different parts of the field. According to the new study, these fluctuations made small pockets of space where the density of mass was so high it collapsed into a black hole. These small mini black holes would have masses around 22 trillion pounds (10 trillion kilograms) — or about the mass of Mount Everest. However, if these primordial black holes do exist, how would physicists find them? Would they look the same today as they did when they were born, almost 14 billion years ago? Over time, the black holes would have attracted and gobbled up more and more mass, Riotto told Live Science. But there may be another force at work, siphoning mass from these black holes: Hawking radiation. Stephen Hawking theorized that due to quantum effects, black holes emit particles and energy. Over time, Hawking radiation may cause them to completely evaporate; the smaller they are, the quicker they disappear. These emissions are so quiet and faint that they have never been detected, although most scientists believe they exist. Between acquiring more mass over time and losing it through Hawking radiation over the course of 14 billion years, today's remnants of primordial black holes could be either tiny or enormous. The idea that black holes existing today could make up all of the dark matter in the universe is relatively controversial. Physicists have ruled out black holes with low mass, because not enough of them have been detected to explain all the extra mass in the universe. However, physicists haven't ruled out medium-sized black holes. For instance, in February 2016, the Laser Interferometer Gravitational-Wave Observatory (LIGO) announced it had detected two merging black holes that were 29 and 36 times as massive as our sun. Primordial black holes in that mass range have not been ruled out, making some researchers hopeful. But some physicists doubt these celestial objects could explain much of the dark matter in the universe. "Given what we know today, it's fairly unlikely that primordial black holes are all the dark matter," Simeon Bird, a black- hole physicist at the University of California Riverside, told Live Science, "But there's no reason they couldn't be 1 to 10 percent of it, as this model suggests. The easiest way to show it to be true would be to detect a primordial black hole." The Large Synoptic Survey Telescope, currently under construction in Chile, would be ideal for searching for these ancient black holes, Bird added. Marc Kamionkowski, a theoretical physicist at Johns Hopkins University, who has authored papers in defense of black holes as dark matter, was similarly circumspect. "My confidence in the idea that black holes make up the dark matter has been shaken a bit the past year," he said, because LIGO hasn’t found enough signatures of black hole mergers to justify the theory, "but I still find the scenario intriguing. This new paper, which provides an early-universe mechanism to produce such black holes, is therefore very interesting." Primordial black holes are still hypothetical, until we detect black holes with masses below that of our sun, and the Higgs field explanation of their creation proposed by these researchers can’t be proven without them. "It’s a nutty idea, but every idea of what dark matter might be is a nutty idea."